Well would you look at this! 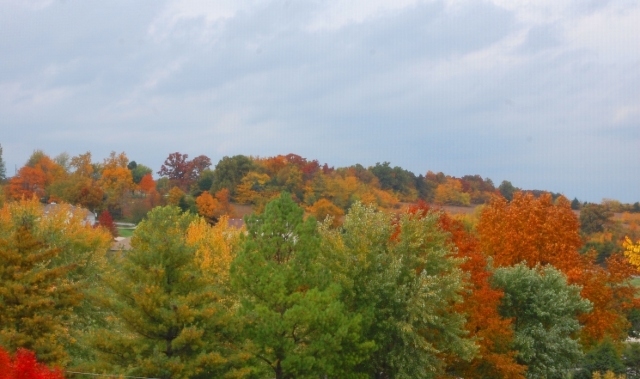 Somebody painted the trees behind my house when I wasn’t looking. I’m going to be honest: even though I smiled at their shrieks of excitement over a pile of leaves the size of a pumpkin (wait till you see what’s coming, kids), I’m almost as excited as they are to have leaves changing colors and drifting in yellow piles onto the driveway. Fall is by far my favorite season and I haven’t had a proper one in almost a decade. (Arizona? Nope. Japan? Mostly pine trees. Texas? Don’t make me laugh!) No wonder Max screamed the first time we passed a tree covered in orange. Max told me that I should pin it to my Pinterest or take a picture of it and post it on my blog so that I would remember it and not forget where I put the recipe, and Greg laughed at me and long story short, here it is. In a pot or a deep skillet, brown ground beef. While it’s browning, chop the onion and add it to the pan. Once beef is brown and onions are nice and soft, add all remaining ingredients EXCEPT sour cream. Stir and bring to a boil, then turn to low and cover. Simmer for about 15 minutes. Then, when you stir it into your chili, it turns pink! I am not kidding when I tell you that this is SO creamy and delicious. We had it with a pan of really good cornbread (another new recipe I tested out) and yes, I did pin both of them to my pinboard of recipes I don’t want to lose. So what?! 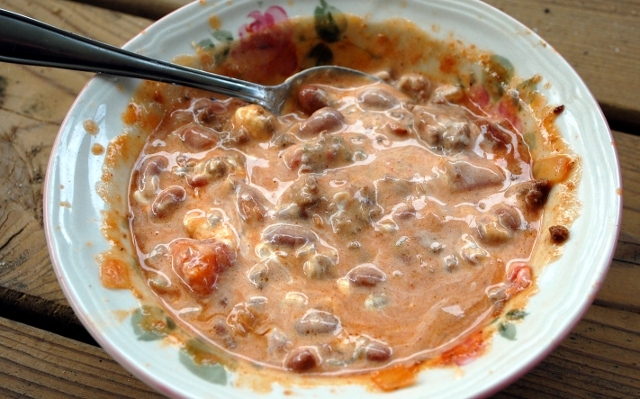 Your pink chili reminds me of my family’s beef stroganof. 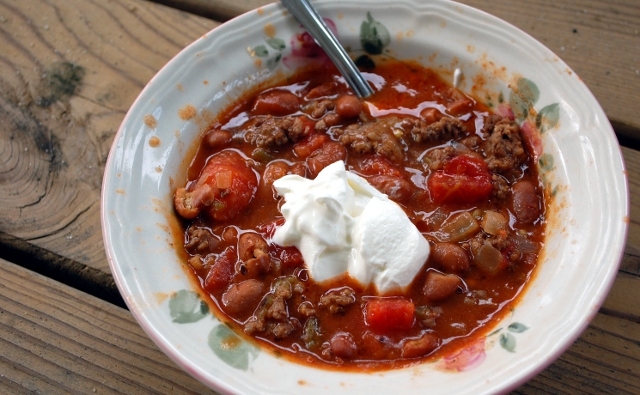 The meat is simmered in tomato juice and the sour cream makes it pink or light orange. Imagine my surprise when I went to a russian restaurant during college and ordered the stroganoff and it was not that color. Grandma’s orange version is still a family favorite and a hard sell to the out-laws. That sounds interesting, but I bet it does taste good!